The power of location. At KU DÉ TA, the view from the 57th floor of the Marina Bay Sands is simply unbeatable. Up there, 200m in the sky, everything takes on a majestic aura as you survey the city below. And now you can have a lazy brunch here stretching from 9am to 3pm on the weekends. The setting of the restaurant is quite cosy, and almost feels like someone's home (well, someone's rather posh home). 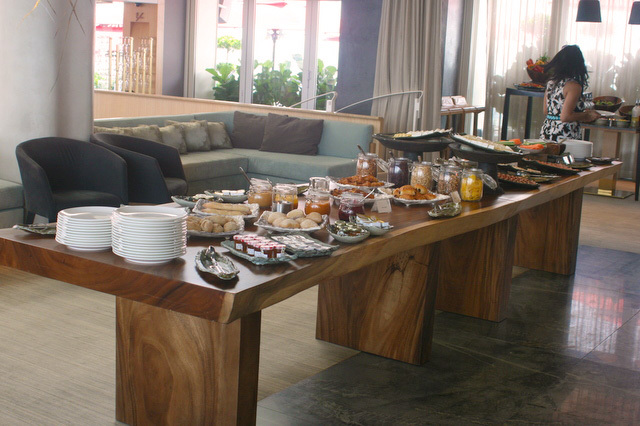 I love the long wooden table upon which they lay out the savoury goodies. It just says, "Let's feast!" 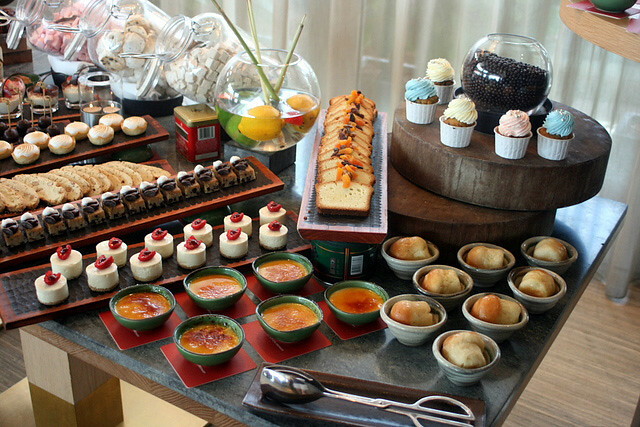 ...mini cakes, creme brulee, bread butter pudding, cupcakes, pound cakes, biscotti and so forth! 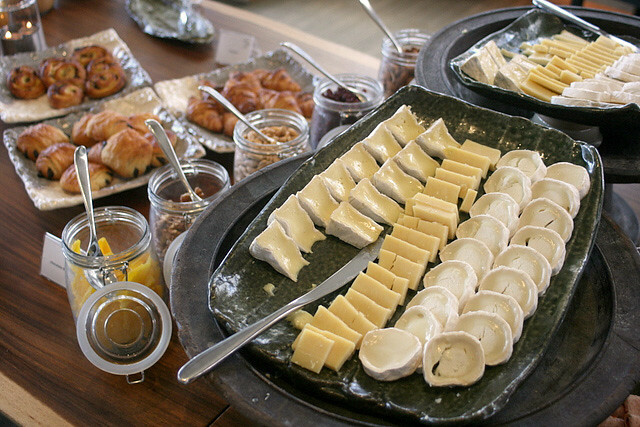 But of course, for me, cheese counts as dessert too. They come with the usual dried fruit and nuts. Croissants and danishes lie close by. 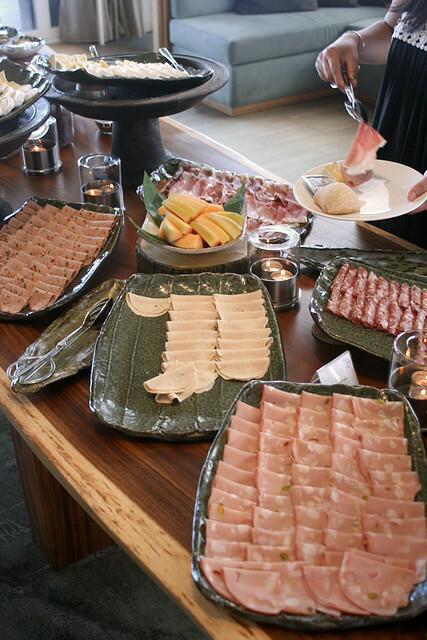 Next to the cheeses, you'll find the cold cuts, including some very nice parma ham and melon! Little rolls and crisp mini baguettes with butter and jam. A DIY soba station (obviously well-ravaged). And yes, salads if you must. But these are just the little things you can amuse yourself with as you wait for your a la minute orders. I like that most of the dishes here are made that way, and not sitting in buffet warmers. And there's plenty on the menu to try. The dishes are meant to be shared, but ironically, that does not mean huge portions. In fact, they encourage you to try many little things. 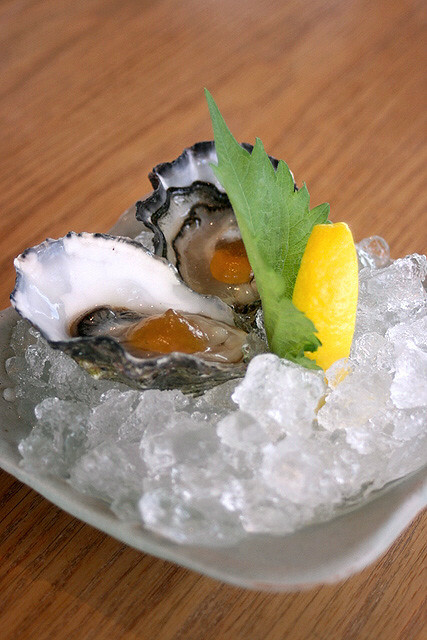 Coffin Bay Oysters with citrus mignonette, tosazu jelly. Free-flow oysters = win, for many seafood-crazed locals. These were a little on the briny side, but really fresh. What's brunch without eggs? 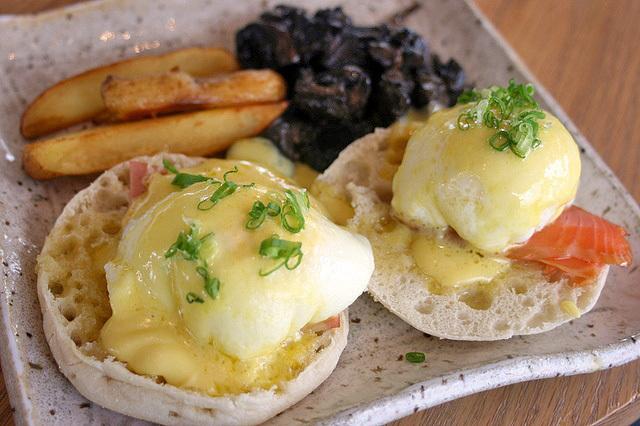 You can choose Eggs Benedict, with paris ham or manuka-smoked salmon (I love the mushrooms). Or two eggs done as you like, with applewood-smoked bacon, duck and potato hash, plus garlicky beef sausage. The eggs baked in claypot with shakshuka sauce were sold out - I wonder what that would have been like. 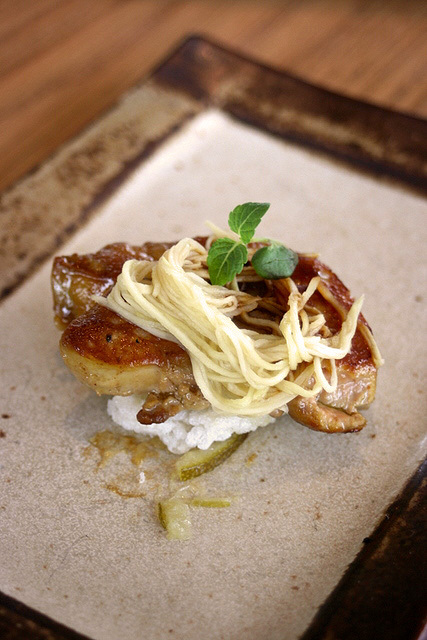 Pan-roasted foie gras & green mango pickle. Oh yes, foie gras for breakfast. Personally I didn't think it needed any garnish or the puffed rice cracker below. 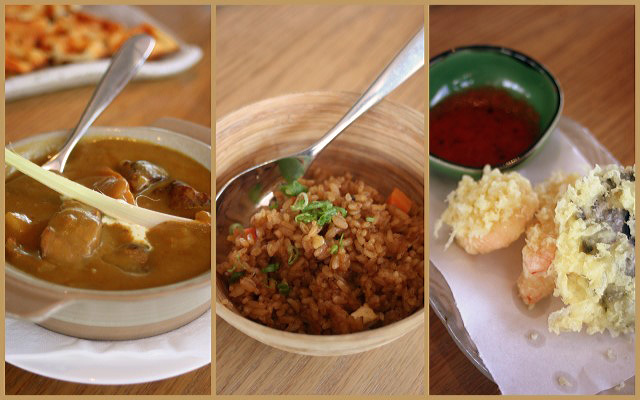 Next time, I'd love to try the grilled yellowfin tuna steak, and the kaffir lime marinated tiger prawn skewers. 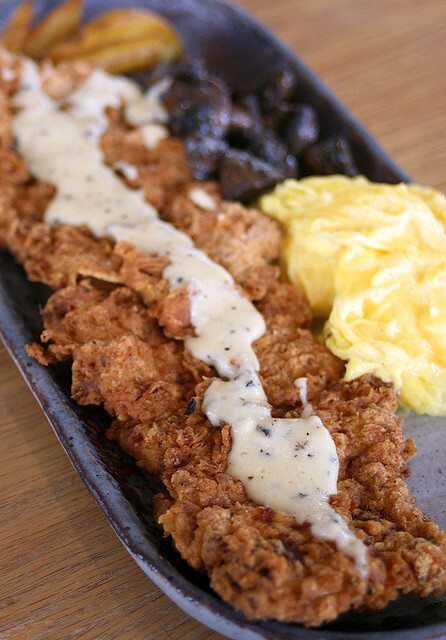 Chicken-fried Steak & Eggs. There is no chicken in here. It's a beef steak fillet coated with herbed and spiced batter, and deep-fried as you would chicken. OK, this is one dish that comes in a huge portion, so one order should feed quite a few! Executive chef Dan Segall likes to play around with Asian food, so you'll find Japanese or Chinese influenced dishes on the menu. Left: braised Australian Black Angus beef in house-blend curry (thick and rich but not enough spicy heat for me). Centre: 'Forty flavour' fried rice (now this was quite spicy, oddly enough). Right: assorted vegetable tempura (part of the several vegetarian options). 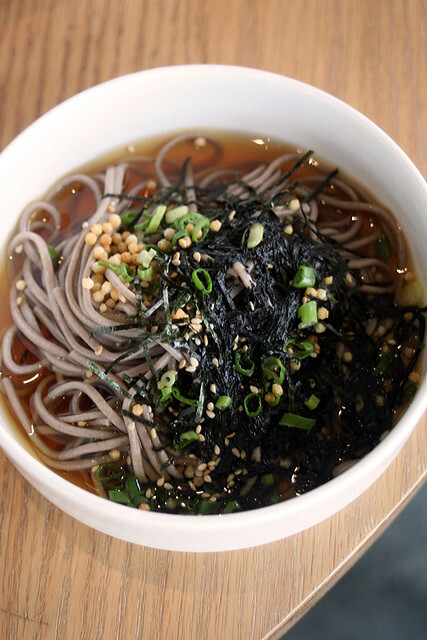 Soba (from the DIY station) in a broth that's pretty strong on mirin, and definitely not watered down. 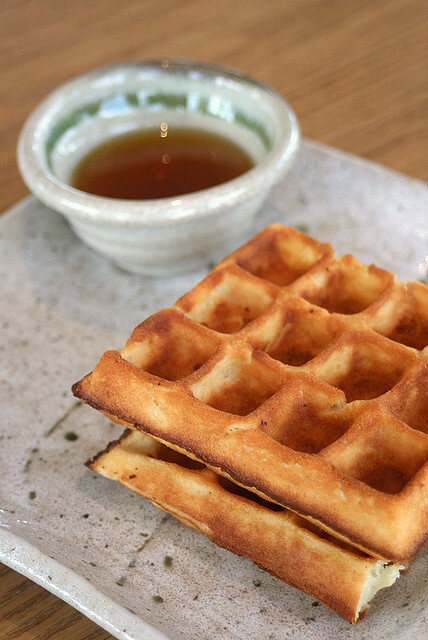 Waffles - plain version with maple syrup, or "inspired" - could be with chocolate or even beef sausage! Pity there's no ice cream to go with the waffles, but you do get smoothies! 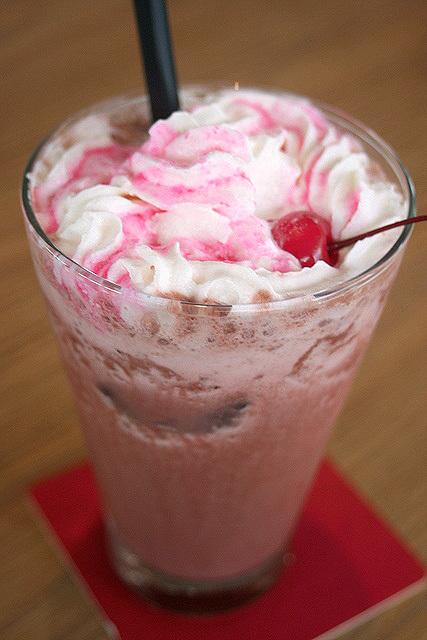 Cherry Choco Smoothie - chocolate and cherries go so well together. 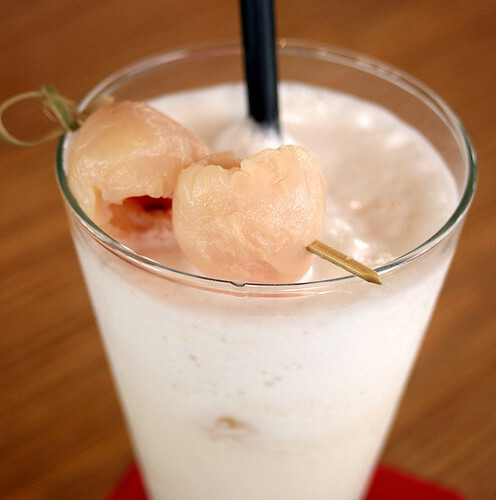 Lychee Coco Smoothie - now this one I like! Lychee, coconut milk and yoghurt. There are also kiwi pineapple smoothies, mango banana smoothies, Oreo shakes, mocha vanilla shakes. 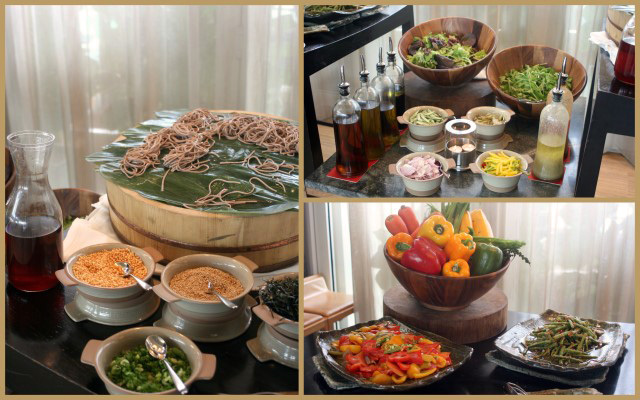 The buffet also includes various tea and coffee selections, soft drinks and juices. It's a great place to bring the family. 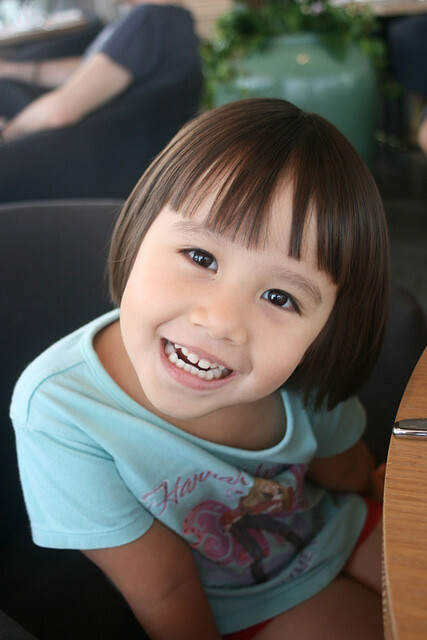 Kids under 6 eat free! 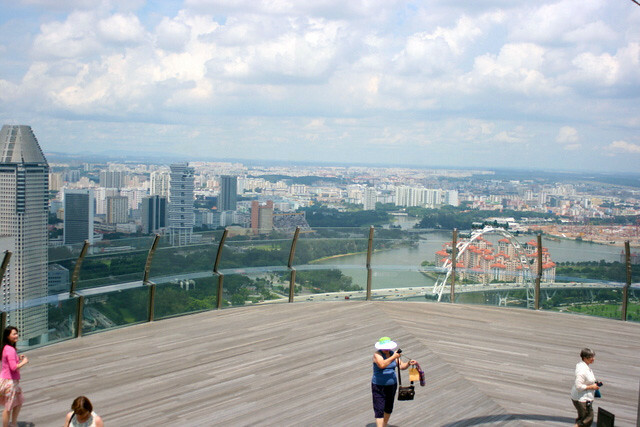 After brunch, it's nice to take a stroll on the observation deck (which normally requires the S$20 Skypark charge). 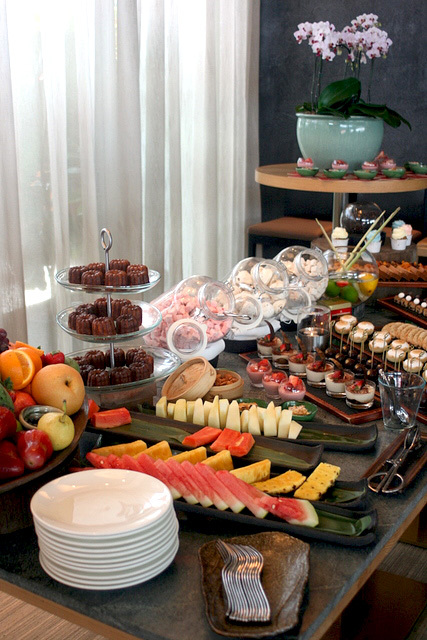 The six hour brunch starts from S$68++ for adults, and S$38++ for kids aged 6-12. You can choose the cocktail or champagne version, for a bit more. 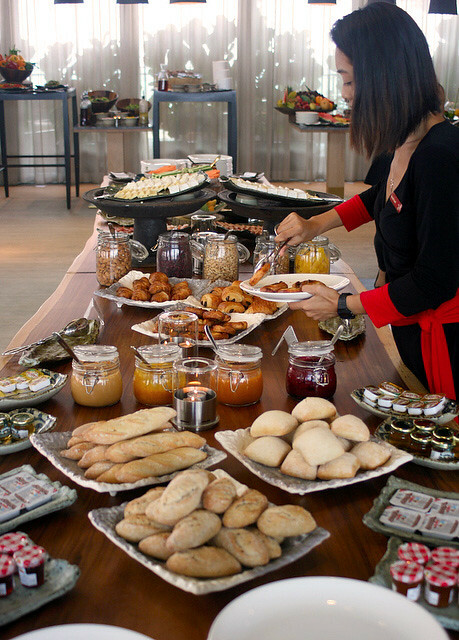 Given that the festive season is coming, surcharges will apply for those holiday weekends: Christmas Brunches (24th and 25th Dec, 10am to 3pm) and New Year’s Day Brunch (1st Jan, 10am to 3pm). Many thanks to Pei Rong from KU DÉ TA for inviting and hosting us! same question, is the foie gras free flow? And ala minute orders free flow too? Hi all, sorry for late reply, but YES, the foie gras, oysters, and all the a la minute items are free-flow. Everything is! Most worthy deal, no? 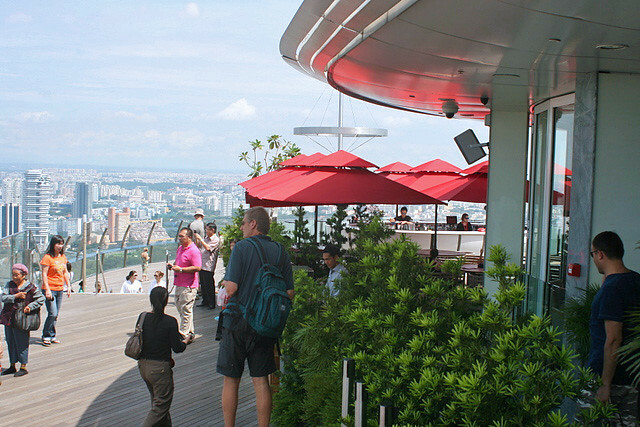 Since the restaurant is located at the skypark level do we need to pay $20 for the entrance fee + $68 for the brunch? Nope. You don't need to pay the $20.